I mentioned some family traditions in my post last week. That made me think about Mom’s spaghetti sauce recipe. That’s what I call it. She called it her “meat sauce” recipe. I had to dig through old recipe files to find my copy of it. I was in near-panic mode when it didn’t turn up in the 3 card files I have. I started sifting through cookbooks, hoping I’d used it as a bookmark. I have a lot of cookbooks – I know, surprising for someone who doesn’t cook very often. Finally, after a 30 minute search, I found the 2 sauce-stained cards tucked into a pocket of a 3 ring binder. Whew. In 3 Tbls olive oil, saute onions, garlic & green pepper until lightly browned. While that sautees, place tomatoes, sauce & paste in a large pot, crushing the tomatoes. Cook on medium heat until it reaches a boiling point. Lower the heat and let simmer. Add 2 Tbls of the seasoning, the bay leaf & the onion mixture. Brown the ground beef, breaking it up finely. Add 1 Tbls Italian seasoning. Drain, and then add the meat to the tomato sauce. Add salt & pepper to taste. Simmer the sauce 5-6 hours, which is the secret to good sauce. Your house will smell wonderful – just make sure you only use a clove of garlic! I’m enjoying the quiet at the moment. Catching up on television shows and movies. I re-watched Lord of the Rings and started season 2 of Downton Abbey this weekend. I can’t wait to see season 3 on PBS in a few weeks! I began to work on the final section of my crusades novella, which means diving back into my references materials to double check events, dates & places surrounding Richard the Lionheart’s departure from the Holy Land and his capture near Vienna in December 1192. It was quite fortuitous to run across a blog post by Sharon Kay Penman about this topic. She is writing the sequel to Lionheart entitled The King’s Ransom, and her comments helped fill in some blanks for me. I’ve sketched out a rough outline of the final chapters of my novella and managed to write almost 1500 words over the weekend. It’s nice to be writing new words after concentrating on the novel edits these last few weeks! And these words, the story tone, and style of writing are so different from my novel – okay, no surprise there, right? Interested in family drama? The Peace family has its traditions, too. Jack Peace shares his bacon-cooking technique with son Nick. Check out Keeping the Family Peace. Let me know what you think of it. Don’t like it? Then just wait until next year. 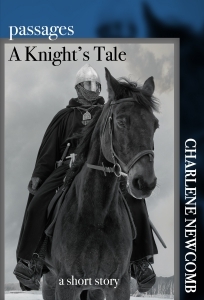 Maybe historical fiction following the journey of 2 knights serving King Richard will be right up your alley. Merry Christmas to all & to all a good night. It was so much better than any jarred sauce. I just might have to buy the ingredients and make it again. And I’d add at least 1 more clove of garlic. I don’t think 1 is enough. Sounds yummy, Marie. I actually made up the recipe for the writers group dinner last week, and I used 3 cloves of garlic! I think Mom went light on it for Dad’s sake. 🙂 And I may now be spoiled. This tasted so much better than anything out of a jar. I may never use ready-made sauce again. 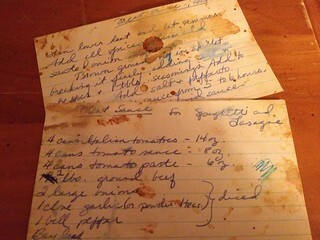 Thinking about Christmas traditions, including dinner… so I thought I’d repost Mom’s meat sauce recipe. Enjoy! Ohhh…what a nice Christmas gift! Have a wonderful time, Char! Pingback: IndieBRAG Holiday Blog Hop | The Many Worlds of Char….